Studies have found that people who live, lead and work with purpose live up to 7 years longer, are 42% more likely to experience contentment in life and at work, and are four times more likely to be engaged in their jobs (Gallup, 2013; National Institutes of Health, 1998; New York University, 2015). In addition, organizations who have a strong sense of purpose are more profitable and outperform the market 6:1 (Deloitte, 2014). Please join Jeff Smith and Zach Mercurio as we discuss defining your organization’s purpose, creating meaningful work experiences and creating a leadership style that allows others to find purpose and meaning in your organization. We will discuss practical tools, tips and case studies on how to build an authentically purpose driven organization. We look forward a great conversation and we hope you can join us. Zach empowers purposeful leaders and helps build purposeful organizations that inspire meaningful work. He is an organizational development consultant, transformational speaker, and Instructor at Colorado State University in Fort Collins, CO USA where, as a PhD candidate, he researches meaningful work and teaches courses on purposeful and organizational leadership. He is the founder of PurposeSpeaks.com, the popular blog on purposeful leadership and is a regular contributor for The Huffington Post and other international media outlets. 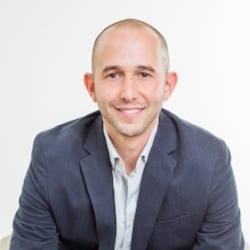 Zach serves as a co-founder of the Foundation for Purposeful Organizations, a non-profit dedicated to promoting and teaching purposeful leadership and management. His research has been featured in the Human Resource Development Review and at the Academy of Human Resource Development International Research Conference.